Will Napster Co-founder Lead California’s Legalization Effort? I had the honor of speaking at ReformCA’s Post-Mortem Seminar: 2014 Legalization Elections where I had the opportunity to share lessons learned from Oregon’s Measure 91 campaign. While I touched upon the text of the measure, based upon lessons learned from previous legalization efforts and polling, as well as some of our campaign strategy, the most important lesson that I could give California advocates was the need to unify. While the Oregon cannabis community has had its fair share of in-fighting among various legalization proposals, once the New Approach Oregon initiative made the ballot and became Measure 91, the Oregon cannabis community largely unified to pass the measure. Very much to his credit, Paul Stanford, fully endorsed Measure 91 and worked with us to remind his supporters that he was urging them to Vote Yes on 91. If Paul, or any other prominent activist worked to oppose Measure 91, we certainly wouldn’t have gotten 56% of the vote, and who knows what the impact would have been. Many people are responsible for legalizing marijuana in Oregon, and Paul Stanford deserves a ton of credit. Not only has he done a lot for the cause and community, but he kept the cause first and foremost to help pass Measure 91. Californians laughed at the ReformCA seminar when I stated that egos must be set aside. “Egos, in California?! ?” rang throughout the crowd. I stated that while putting aside egos can be a monumental task in a huge state like California with a lot of big money interests and a lot of big personalities, it is simply imperative. Legalizing marijuana is a tough task and many obstacles must be overcome. In-fighting within the cannabis community is a self-inflicted wound that can clutch defeat out of the jaws of victory. I am not naive enough to believe that putting aside egos in California will be as easy as it was in Oregon. Oregon has about 4 million people while California has 36 million, that makes California essentially 9 Oregons in population alone. Throw in the fact that the Golden State had many producers, processors and retailers engaging in regulated cannabis commerce much longer than Oregon, also means that there are many more players that want their voice heard and can have their voice heard, just based upon their economic strength. I have many people that I call friends and colleagues working on various legalization efforts in California and I greatly respect them and the work they are dedicating to ending prohibition; and I appreciate them taking on such a monumental task. I admit that I didn’t contact anyone about this blog, these are just my observations from afar. Despite the obstacles in California’s way, I was hopeful that national funders and most local advocates would rally behind the ReformCA team that put together a rather impressive stable of advocates and politicos. However, California being California, there were several competing initiatives filed by various activists and national funders seemed to take a step back, waiting to see how things would shake out, including the text of ReformCA’s initiative. ReformCA’s website listed partners that included the Drug Policy Alliance and the Marijuana Policy Project. The coalition’s separate site still lists the DPA and MPP as “coalition partners,” alongside Americans for Safe Access, California NORML, Law Enforcement Against Prohibition, the California Cannabis Industry Association and the Greater Los Angeles Collective Alliance. However, after we reported this week that “the coalition includes NORML, the Drug Policy Alliance and Marijuana Policy Project,” ReformCA had those organizations removed from its website. The Drug Policy Alliance, one of the biggest players in marijuana politics, might go its own way. It’s preparing its own language for circulation that could be filed later this month if DPA principals aren’t happy with other initiatives being prepared, L.A. Weekly has learned. Parker, who put $600 million of his reported $2.5 billion fortune in a philanthropic foundation this summer, has said very little on the marijuana issue publicly, aside from a throwaway comment calling earlier efforts “half-baked” in a San Francisco Chronicle story published last year. But he has secured the services of Sacramento campaign veterans Gale Kaufman and Brian Brokaw, as well as former Newsom campaign insider Jason Kinney, according to sources speaking on condition of anonymity (none of the three responded to requests for comment on Monday). After throwing around $1.7 million in state and local elections in 2014 — including $300,000 in San Francisco — Parker has contributed to two campaigns in California this year: $56,400 to Newsom’s 2018 gubernatorial bid, and $500 to District 3 Supervisor Julie Christensen. He may go off on his own. Sources close to the legalization efforts say that Parker’s team could release its own legalization language soon, perhaps as early as next week. Regardless of whether Sean Parker, Drug Policy Alliance, ReformCA or any other measure manages to get the necessary funding to move forward, I sincerely hope that the California cannabis community eventually rallies behind whichever measure has the best chance passing at the ballot box. Whether you think that only one legal ounce is enough or a 10 x 10 grow space is optimal, clearly you must recognize that it is a better policy than prohibition. California has historically had fantastic cannabis laws across the country. The Golden State, a pioneer in sensible marijuana law reform, kicking of the medical cannabis revolution in 1996, has an opportunity to add fire to an already red-hot marijuana movement. 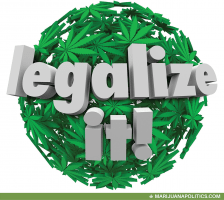 Legalizing marijuana in 2016, in the eighth largest economy in the world, will have massive ramifications. In the United States, there will be 53 congressional seats representing a state that has legalized marijuana; these constituents, even many who opposed legalization, will start demanding laws that treat marijuana businesses as any other business. Ending cannabis prohibition in California will greatly hasten the end of federal prohibition, and if the U.S. stops promoting a global War on Marijuana, other countries will quickly follow suit. California cannabis reform advocates, please legalize in 2016, the world is watching.